Although the technical and tactical side of the game is at utmost importance, the physical aspect of the game cannot be neglected. At the highest level where teams are evenly matched technically/tactically, physical qualities such as speed becomes the decisive factor that makes the difference in the game. Last season, one of the most dramatic stories in the world of sport had been written as Leicester City FC clinching the English Premiership title. One of the key players was Jamie Vardy who scored 24 goals in the season, exploiting his extensive speed with the team’s counter attack. 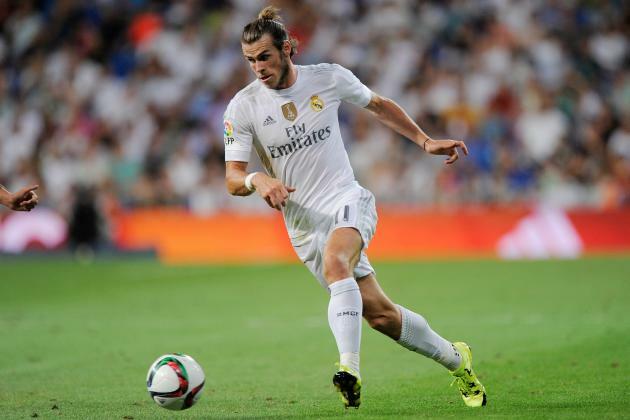 There have been numerous occasions where phenomenal speed from likes of Gareth Bale creating a decisive moment that changed the game. The following video shows the moments when speed is maximized to create goals or goal scoring opportunities. Speed is a huge asset of a player and a threat to the opponent. Many people think that speed is an innate quality, which is true to some extent, but it is a skill that could be learned and developed (Young, 2010). When people talk about speed in soccer, many times linear speed is hidden in the shade of the qualities like agility and change of direction. As the video reveals, however, speed development, particularly the linear speed, could be vital. There are more evidences that divulge the importance of speed development. 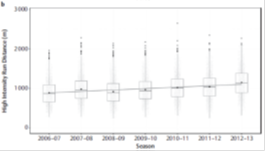 In analysis of goal scoring situations and situations immediately preceding the goal from the first German national league during second half of 2007/08 season, straight sprinting was the most regularly observed action for both goal scorer and the assisting player (Faude, Koch, & Meyer, 2012). Many people also think that the speed with the ball (sprinting while dribbling) is more important in soccer compared to sprinting without the ball; however, the same study found that most of the sprints made from the goal scorer were directed without an opponent or the ball (Faude et al., 2012). 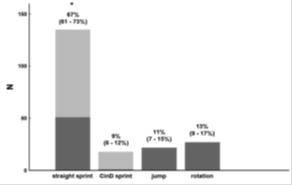 Another study from Haugen, Tønnessen, Hisdal, and Seiler (2014) described practical analysis of sprint data. The data from Norwegian Olympic Training Center, 40m sprint tests of 628 male and 165 female elite athletes from 1995 to 2010, showed that the difference between 75th and 25th percentile for male and female over 20m sprints were 0.13 and 0.16 respectively. This indicates that the fastest quartile had 1m advantage over the slowest quartile over 20m – for the greatest extent, 90thpercentile had more than 2m advantage over the 10th percentile. According to the study, 30-50cm difference is probably enough to take advantage of decisive moment in putting the shoulder in front of opponents, indicating how 1 to 2m advantages make huge difference in the game. One of the FIFA reports revealed that “70% of the goals scored from open play are the result of accelerated attacks or counter-attacks” (p. 11). The same report stated half of goals are scored from a cross – this indicates the importance of speed development as the crosses are usually the products of the wide players (i.e. wingers, wide midfielders, and wide defenders). The sprinting analysis of elite soccer players from UEFA Champions League and UEFA Cup identified that wide midfielders topped all sprinting measures such as highest number of sprints, total sprint distance covered, explosive sprints, and leading sprints followed by wide defenders and attackers (Di Salvo et al., 2014). As the various studies indicate, there is a vast amount of data that exhibits the importance of speed and sprinting abilities in soccer. These are the indications that speed development and sprint training are of the greatest importance in modern soccer. Developing those split seconds, split meter advantages may or may not get you the winning goal. Sprint training is a vital tool for all teams to maximize their chances of creating goal scoring opportunities. Barnes, C., Archer, D. T., Hogg, B., Bush, M., & Bradley, P. S. (2014). 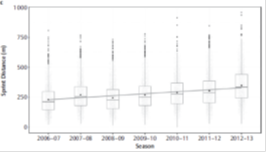 The evolution of physical and technical performance parameters in the English Premier League. International Journal of Sports Medicine, 35, 1-6. Di Salvo, V., Baron, R., Gonzaleze-Haro, C., Gormasz, C., Pigozzi, F., & Bachl, N. (2010). Sprinting analysis of elite soccer players during European Champions League and UEFA Cup matches. Journal of Sports Sciences, 28(14), 1489-1494. Faude, O., Koch, T., & Meyer, T. (2012). 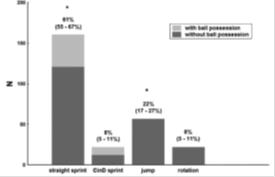 Straight sprinting is the most frequent action in goal situations in professional football.Journal of Sports Sciences, 30(7), 625-631. Haugen, T. A., Tønnessen, E., Hisdal, J., & Seiler, S. (2014). The role and development of sprinting speed in soccer.International Journal of Sports Physiology and Performance, 9, 432-441. Young, M. (2010, November 11). Speed is a skill. Athletic Lab.